Young stars Vijay Deverakonda and Rashmika Mandanna will soon be seen in Geetha Govindam. The film releases on August 15. 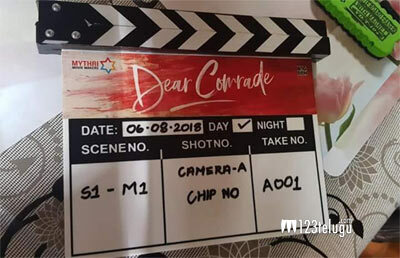 Meanwhile, Vijay and Rashmika’s second film together, Dear Comrade, went on floors today. Dear Comrade is an intense, romantic action drama and Vijay will be seen as a student leader in this campus drama. On the other hand, Rashmika plays a cricketer. Debutant Bharath Kamma is the director, while Mythri Movie Makers and Big Been Productions banners jointly produce the movie.